This undergraduate brat started working at an early age and had to quit his IIT dream in absence of resources, though achieved significantly in strengthening the Google SERP’s rankings of businesses. Ravi Verma, a 3rd year student pursuing Bachelor’s in English Hons. picked up his first part-time job at the age of 18 in Sales & Marketing, keeping a plunge towards suave transition into another career alternative. 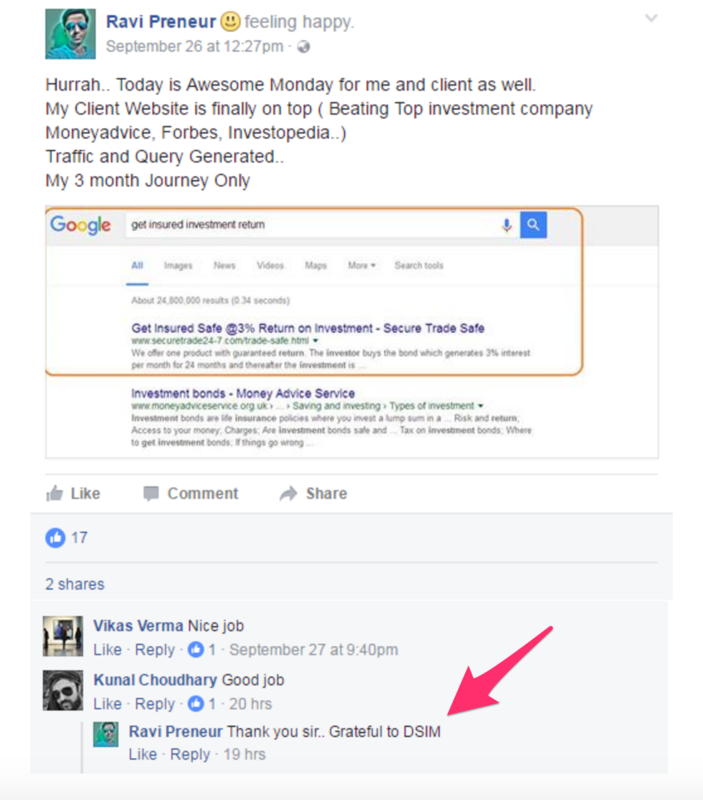 Finally, it felt like utterly unhappy and dissatisfied with his sales job routine and he chose to go for digital marketing training. Being a tech-savvy guy and driving inspiration from success stories of DSIM trainees present online, he chose the name. On completion of the training, Ravi joined ‘Logicsoft’, a UK based company as a Digital Marketer. He is currently taking care of 6 projects at the place, holding expertise & ability in SEO and runs his own website plugin.in. He additionally conveys creative SMO ideas, works to boost clients’ Google SERP’s rankings and offers SEO advices to individuals through his Social Media profile. “It all started with an interest,” says Ravi. Considering DSIM as a brand, on the very first day of my training, I walked into the place like a beginner. Attending sessions with my student and entrepreneur friends, I took in a great learning and today have turned out to be adequately ready to bring the digital marketing ideas into execution. What could be the greater transformation than this? He has plans to take on larger efforts and is working on a project to venture a digital marketing agency with his partner. He further clarifies that it would be his key priority to offer quality and outstanding digital marketing services to clients.